Delta customers will soon take flight with HGTV’s dynamic — and identical-twin — home renovation duo the Scott brothers and everyone’s favorite mischievous monkey, Curious George. Exciting new content is making its debut on Delta Studio, including selections from Refinery29, Disney XD, Hulu and Food Network. Hulu – Catch up on current-season episodes of original premium series, including The Mindy Project and the Emmy-nominated East Los High. Coming later in 2017 will be the can’t-miss TV event 11.22.63 from J.J. Abrams and Stephen King, the Golden Globe-nominated comedy series Casual, the critically-acclaimed comedy series Difficult People and the compelling drama series The Path. Refinery29 – This curated selection of original series features a variety of trusted and relatable personalities and runs the gamut of women's interests, including lifestyle, fashion, comedy, sports, and more. From living on a budget in NYC with Try Living with Lucie to exploring Tokyo's Harajuku fashion subculture with Style Out There to makeup tutorials and style tips with Dear LA with Jenn Im, Refinery29 inspires women to pursue a more independent, stylish and informed life. WNYC Studios – Listen to podcast episodes from WNYC Studios including Radiolab, Freakonomics Radio, Here’s the Thing with Alec Baldwin and Snap Judgment. Every Day Networks – Every Day Networks serves intersecting communities of people with a passion for travel, entrepreneurship and sports. Check out Fuel TV for action sports, Business Rockstars for startup and entrepreneurial advice and PlanesTrains+Automobiles for global travel and lifestyle content. Disney XD’s Star Wars Rebels – Set between the events of Star Wars Episodes III and IV, Star Wars Rebels continues the epic tradition of the Star Wars saga with action-packed animated adventures featuring the crew of the starship Ghost. Season 2 and the first four episodes of Season 3 are currently available. Curious George & Curious World – Delta has partnered with global learning company Houghton Mifflin Harcourt and NBC Universal to bring Curious George to young passengers and their families, along with several original STEM-themed series from Houghton Mifflin Harcourt’s early learning content service, Curious World. The series include A Rhino Named Paul, Let’s Go To Work and Superpower Heroes. Each episode contains lessons in science, math, engineering and technology with proven impact supporting STEM curriculum. Food Network – Fill up on all your foodie favorites, including Chopped and Kids Baking Championship. HGTV – Get home design, decorating and remodeling ideas with hit shows like Property Brothers, Fixer Upper and Flip or Flop. Headspace – Headspace offers guided and unguided meditations, animations and videos teaching users the skills of meditation and mindfulness. Tune into a variety of content geared towards air travel, including ways to help calm anxious fliers and conquer jet lag. 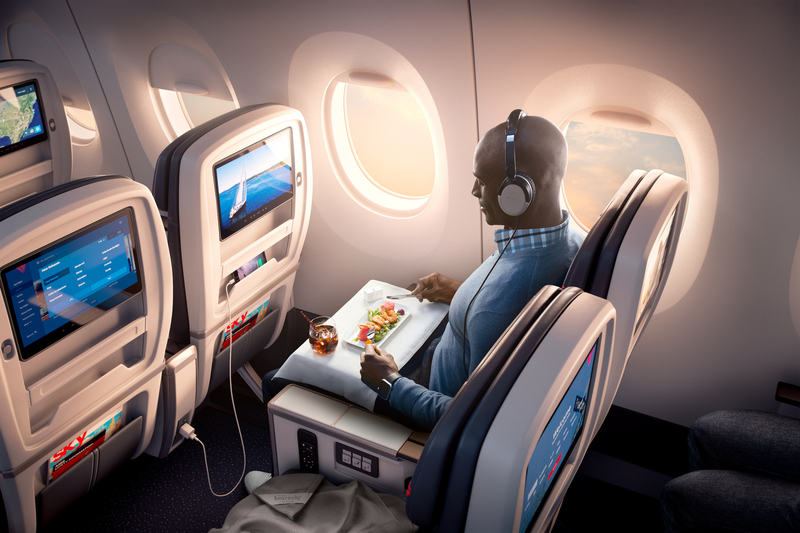 Delta Studio’s industry-leading in-flight entertainment collection provides the best depth and breadth of content in the skies, from its lineup of best picture nominees during awards season to having nearly all of the recent box office hits in its repertoire. The entertainment selection is offered free to all customers on two-class aircraft. This includes up to 300 movies, 750 TV shows, 100 foreign film titles, 2,400 songs, 18 channels of live satellite TV on select aircraft and a selection of games on aircraft with seat-back entertainment systems. Delta has invested billions in its on-board product and the customer experience with orders for hundreds of new aircraft and a cabin modernization program that includes new seats, seat-back entertainment systems, high-capacity overhead bins, new lavatories, ambient lighting and access to Wi-Fi on nearly all flights, among other enhancements. Delta Studio content is available on the seat-back entertainment systems and through in-flight streaming via the Gogo Entertainment app. Customers can stream content without purchasing a Wi-Fi pass by downloading the Gogo Entertainment app before flying or even in-flight. For more information, see this step-by-step guide.